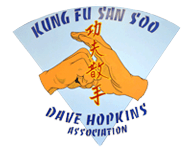 Dave Hopkins' Kung Fu San Soo classes are specifically designed to teach students to become successful leaders and martial artists. We are committed to providing a safe, caring and educational environment supporting and actively encouraging the personal growth of our students. We offer fast-paced, fun-filled Kid's Martial Arts classes including Little Dragons, Kids and Teens that helps each student grow in a positive, well-disciplined, yet challenging way. No matter your skills level, Dave Hopkins' Brazilian Jiu Jitsu classes have tailored lessons to our students so they can tackle and achieve any goal they've set. Dave Hopkins Kung Fu San Soo's Cardio Kickboxing classes give our students levels of confidence, self-esteem and fitness they never dreamed of, not to mention the techniques and skills of Kickboxing to make them tough, conditioned and knowledgeable enough to defend themselves in any situation. Our Self Defense program is a practical and direct form of hand to hand combat. San Soo has been proven an effective form of real world self-defense for law enforcement and the everyday person alike.